There’s always a room or space that lacks character in most homes. This area often ends up being used for storage and becomes filled with old furniture, knickknacks, anything we’re not using basically. However, doesn’t every room in a home deserve a little love and attention? I encourage you to clear out anything you don’t cherish or find useful enough to use on a regular basis and maximize that space to its full potential. Get creative! What would you wish to accomplish in this area? Perhaps a cozy reading or computer nook? A smaller space could also become a fabulous showcase for your favorite books and collectibles. For us, that unappealing space was our den. We were never attracted to it ever since we bought our house and I wondered why. After taking a closer look at it, I realized just how dated the fireplace was and how it made the whole room appear off-balance. I had already repainted the massive shelf, white (it used to be stained wood in a cinnamon tone) and figured that the previous yellow tile would be fine for a while. But, the paint alone, didn’t solve the problem. The fireplace still looked drab and it was one of the reasons why we never gave that room much thought into making it a relaxing space to gather with the kids. Obviously, the yellow tile had to go… but there was more that needed to be done. 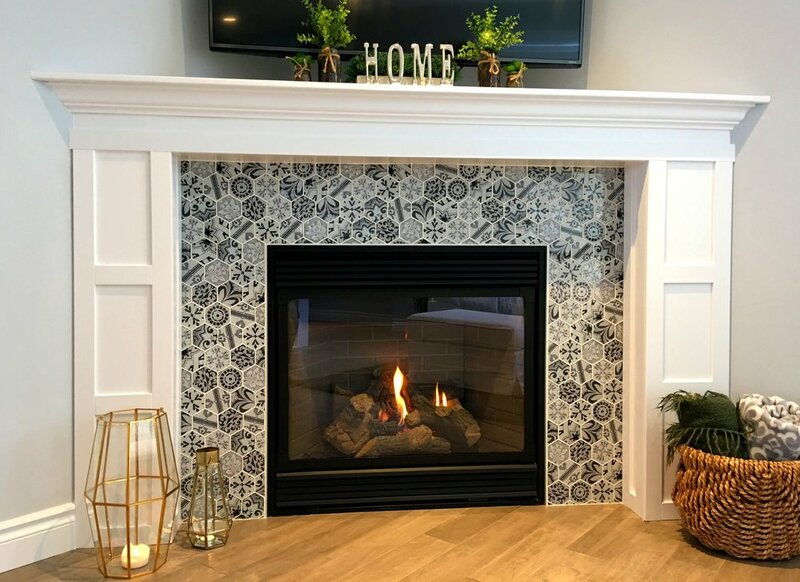 Looking at different images of mantles online, I came up with the idea to build a frame beneath the top shelf to give the fireplace a real mantle and create the balanced look the room needed. Try to find mesh-mounted tile if you’re looking for a quick and easy installation. By the way if you’ve never worked with glass tile, I suggest wearing gloves during the cutting process… my husband didn’t and found tiny cuts all over his hands afterwards. We built a frame from 2x2 inch dimensional lumber and added wood paneling over the frame, sheet rock can also work for this. Then, we cut pieces of 2x¼ inch trim to enhance its design, plus a few coats of glossy white paint. The whole project was completed over a weekend and we’re very happy to have put our creativity to the test, the result is fabulous! We now look forward to spending time in this cozy and inviting space! To enrich your home’s distinctive character, create a focal point that pops in every room!